In a previous article, Intelligence Perspective on Benghazi, we looked at events in Benghazi that resulted from a minimalist approach to military security and response. However, Benghazi was not the first time in recent history when political fantasies held dear in the White House led to misjudging the character of our enemies and the nature of the military conflict. Image by US Marine Corps, public domain. In March of 2003, the US invaded Iraq. At least that’s how the mainstream media recorded it. In truth, the invasion started eight months earlier when the CIA and the US Joint Special Operations Command began operating in Iraq with several important goals. These goals included identifying Iraqi leaders who might be willing to turn against Saddam Hussein, organizing the Kurds against the growing Islamic radical groups in Kurdish areas, and locating Iraqi chemical warfare assets. On the morning of March 20, 2003, a coalition led by the US and the UK launched the main invasion known as the Iraq War. The stated purpose was to overthrow Saddam Hussein’s government. This invasion proceeded remarkably well in spite of Turkey’s last minute reversal on its agreement to allow the US 4th Infantry Division to enter Iraq via Turkey. After defeating the Iraqi military and deposing Saddam Hussein, the Coalition faced the question of how best to manage the post-Saddam Iraq. It remains unclear what, if anything, political leaders in the US and the UK envisioned for that task. What transpired was an attempt at minimal political forcefulness while waiting for something like “government” to occur in Iraq. It didn’t occur. While the Coalition was happy to turn over the governing of Iraq to the Iraqis as quickly as possible, the Iraqis, mired in their age-old tribal and religious conflicts, were largely unwilling or unable to perform a reasonable imitation of a functioning government. Twelve years later, they are still struggling with that same basic challenge. On April 23, 2003, in response to intelligence indicating an increasing presence of armed Islamic militant insurgents in the area, the US coalition sent 700 troops from the US 82nd Airborne Division to take up positions in the city of Fallujah. 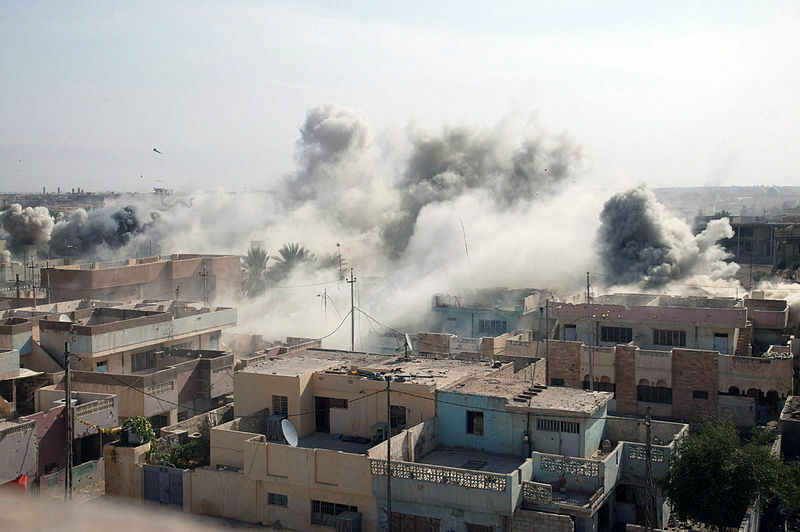 The Coalition’s chief concern in this operation was avoiding Iraqi casualties and property damage, and the paratroopers operated under heavy limitations. As events unfolded in Fallujah in the following months, the concern for avoiding Iraqi casualties and property damage remained paramount in the minds of the Coalition’s civilian leadership. I can’t help but wonder why the coalition didn’t send something other than combat units to Fallujah since they were apparently hoping for something other than combat to occur? Note to US politicians: If you want war, send the US military. If you want something else, don’t send the US military. Apparently, some folks in London and D.C. thought they could magically will away a growing insurgent and terrorist presence in Fallujah. No one in our government has yet explained to me precisely what sort of magic was expected to occur, but whatever spells were cast, they did not have the desired effect. Predictably, on June 28, 2003, while sitting in Fallujah and doing their best to “look friendly,” US troops attracted gunfire during a protest and returned fire. That’s what paratroopers do when they are fired on. They fire back. Seventeen Iraqis were killed, and 70 more were wounded. The paratroopers exercised restraint and didn’t kill the other 200 protestors. The 82nd Airborne was replaced by troops from the 101st Airborne and 3rd armored cavalry. In the aftermath, Fallujah became a rallying point for the anti-Coalition insurgents and their terrorist pals. On February 23, 2004, the insurgents escalated their activity by attacking three Iraqi police stations and the mayor’s office. On May 1, 2004, the US optimistically decided to turn over the security of Fallujah to a newly formed and US equipped Iraqi Fallujah Brigade. The Brigade’s only accomplishment was to surrender its weapons to the insurgents when it deserted in September of 2004. At that point, the US had suffered 27 dead, and the Iraqis had lost approximately 400 insurgents and terrorists, and approximately 250 non-terrorist civilians. On November 8, while British forces patrolled the surrounding area, the US Marines began attacking the city. Bloody fighting took place until December 23, costing the lives of 95 Americans and wounding 540 more. Four soldiers from the UK died, and ten were wounded. Iraqi soldiers counted eight dead and 43 wounded, along with approximately 800 Iraqi civilian deaths. The terrorists lost from 1500-2000 fighters, and around 1500 more were captured. In my estimation, Fallujah unfolded as it did and Iraq became an enormously expensive problem because the US and the UK, though willing to pay the price in blood and treasure to defeat Saddam Hussein, declined to run the country we conquered long enough for it to actually become a nation. In my opinion, the US Bush Administration and the UK government led by Tony Blair allowed themselves to pursue a fantasy of Nice War. Because of our leadership’s pathological insistence on pretending the Iraqis were actually cooperating with us, we continue to pay a high price in blood and treasure. US Consulate in Benghazi , burning on 9/11/12. Image by Voice of America. When we compare the events in Fallujah in 2004 with the September 2012 events in Benghazi, we see many similarities born from the Nice War concept. In both cases, the US administrations allowed their political and sociological philosophies to cloud their judgment. In both cases, our presidents thought that force used could be minimized. But in both cases, to the detriment of the US forces on the ground, they underestimated what level of force was needed. We now know that in Benghazi, as in Fallujah, both presidents had sufficient information with which to make better decisions. The dissimilarities are equally apparent. In Fallujah, the journalists were present in large numbers and were willing to report what they saw, though at times they were unable to understand what they were seeing. In Benghazi, the events occurred out of sight of the US media. In Fallujah, the Bush administration dealt frankly with the press. In Benghazi, the Obama administration lied to the press and to the American people and was caught, but for the most part, the press has been willing to ignore that. Thank God for a voice from someone who not only knows what he’s talking about but isn’t afraid to publish it. Thanks, Jay. Hi David. Thank you for your kind assessment. Hi Michelle. Thank you for your thoughtful response.